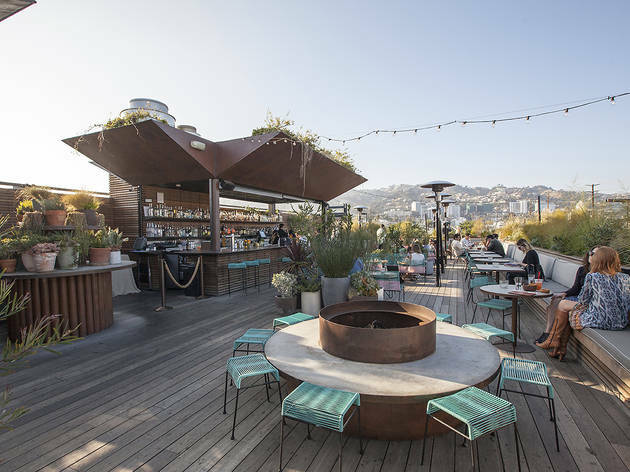 Take in the view of the Hollywood Hills alongside sips of spiked bubble tea at this music-inspired rooftop bar. 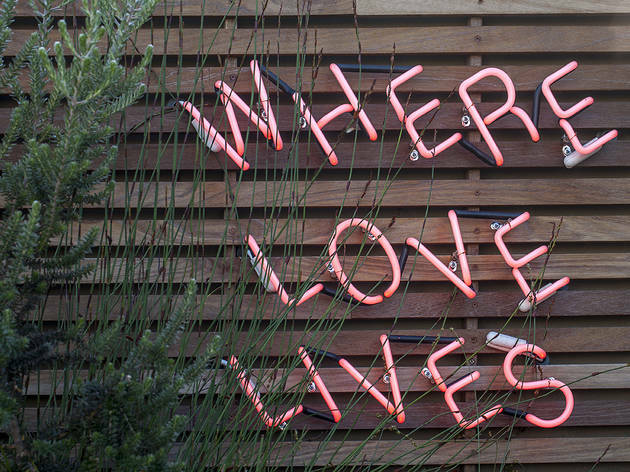 There’s a party happening at the intersection of La Cienega and Melrose—and while everyone is invited, not everyone may fit in. 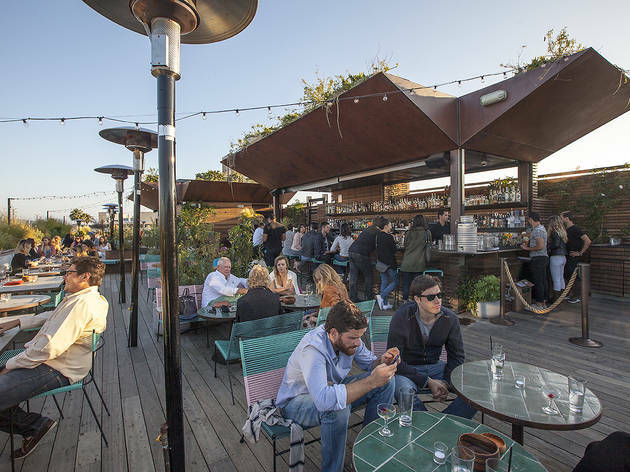 That doesn’t mean you shouldn’t give L.P. Rooftop a try, though. E.P. 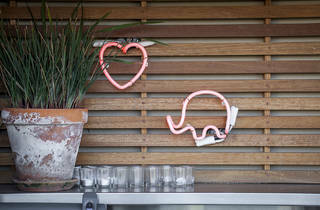 & L.P. (music slang for “extended play” and “long play”) is the brainchild of two seasoned Australian restauranteurs, a multi-storied space where the ground level and stairwell are decked out in macaroni wallpaper and enveloped in a sapphire glow. One story up is E.P., a restaurant featuring a hodgepodge of Asian cuisine. That’s for another night. Keep going until you hit the top floor, swing that tinted door open and breathe in the fresh city air. You’ll be greeted by a good-looking person, who may or may not ask if you're on the list. On most nights, it actually doesn’t matter, so go on in and take a seat in one of those chairs made out of elastic string that’s strangely comfortable. 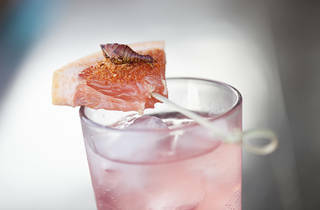 On your left, a reality star cautiously drinks a pink cocktail loaded with bursting boba balls. On your right, a guy straight out of GQ is taking selfies with the Hollywood Hills. This place has killer views, so that’s to be expected. 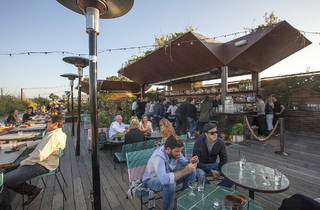 If you’re lucky, you might be able to get into the super exclusive patch of rooftop known as Frankie’s, a private bar with daybeds. Get passed the rope and you know you’ve really made it. 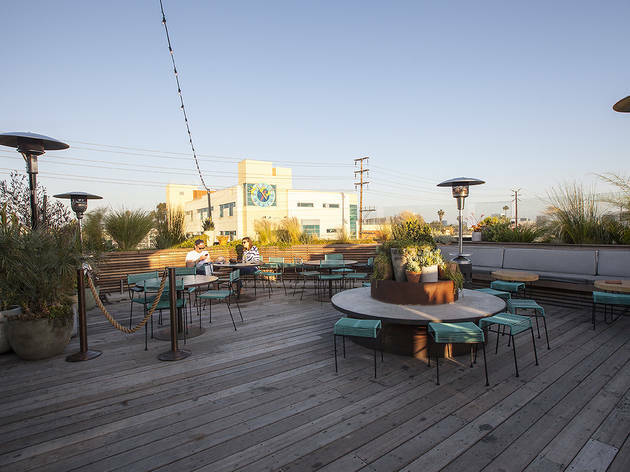 Good for: Sharing a pitcher of spiked bubble tea and Fijian nachos with new friends or industry colleagues as the sun sets on West Hollywood. The dress code tends to be a tad more casual earlier in the week, and seats are a lot easier to come by. 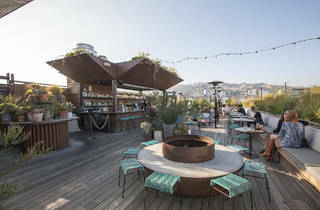 Beginning Thursday night, however, the expansive topiary-lined terrace turns into a full-on club, complete with live music and packed crowds—best for singles ready to mingle. The scene: Trendy is a given in this part of town. There’s a mix of young and old, but everyone is beautiful—at least on the outside. 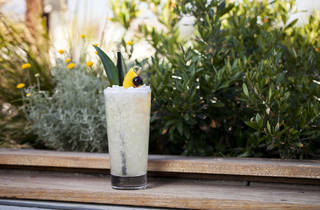 The pretty drinks and stunning scenery combine to give the sprawling deck a hip Hollywood atmosphere. And the fact that incognito types could potentially rent out Frankie’s only makes it cooler. 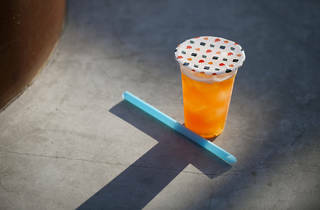 Drink this: The tiki-inspired Californication ($15) off the “bubble tea mouth party” section of the menu is a blast to drink. 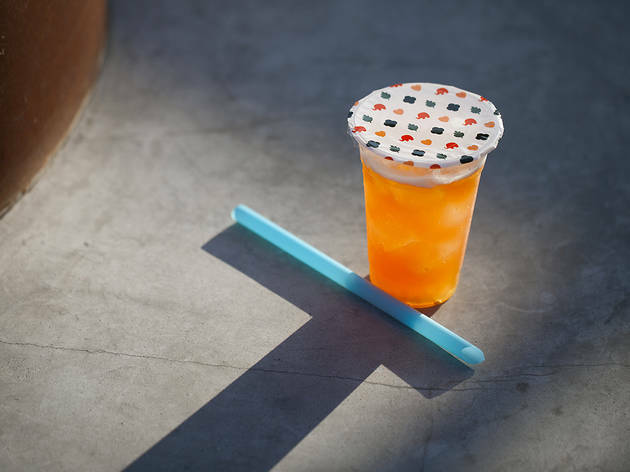 Bar lead Brittney Olsen (Break Room 86) has crafted this tropical rum libation with passion fruit boba rather than tapioca balls, which burst in your mouth with every other sip. 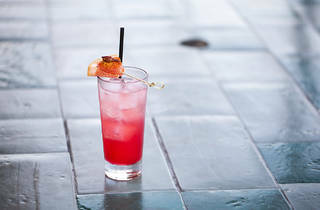 The bitter Campari definitely comes through, but helps temper the sweetness of the fresh pineapple and toasted coconut syrup. Another swill along those lines is the Rebel Rebel ($13, $75 for a pitcher). 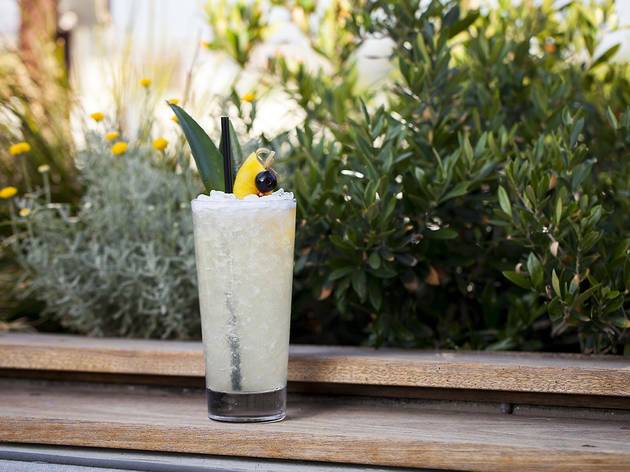 It’s a funky blend of pisco, vermouth, fresh lime and pineapple juices, house-made jasmine-infused simple syrup, and yuzu bitters poured over a tall glass of crushed ice—an ideal beverage for rooftop imbibing. 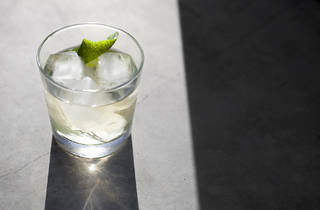 Even the non-old fashioned drinkers will enjoy Life Cultivated ($15, $100). 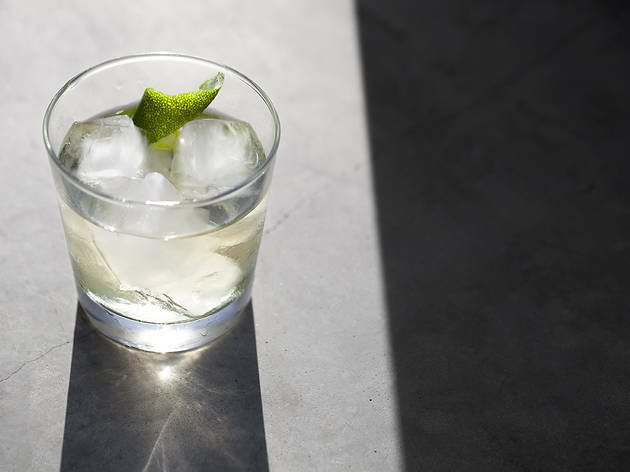 Japanese whiskey, cinnamon, ginger, fresh lime zest and cardamom bitters all come together in beautiful harmony. 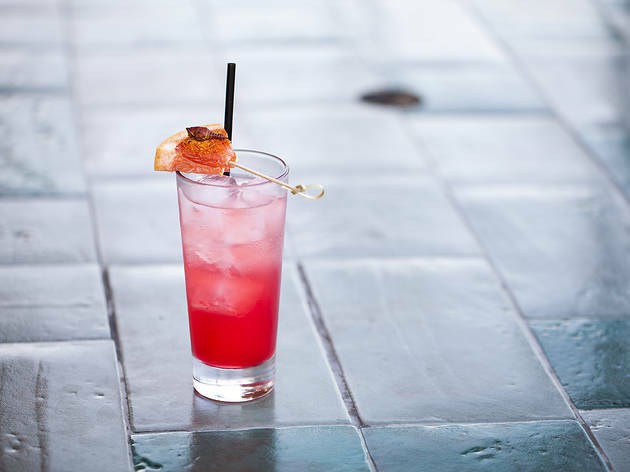 The outcome is a bright and zesty easy sipper. 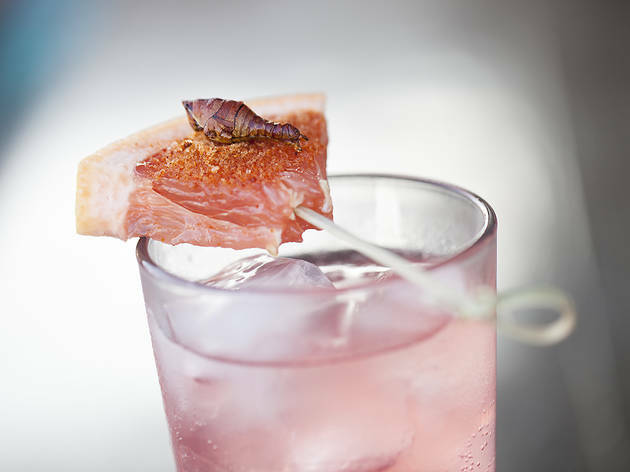 If you're able to make it over to Frankie’s, there’s one adventurous ‘tail off the menu that’s worth checking off your drink bucket list: Creep, a tequila cocktail made with Sal de Gusano (spicy worm salt) and dried crickets. Delish. 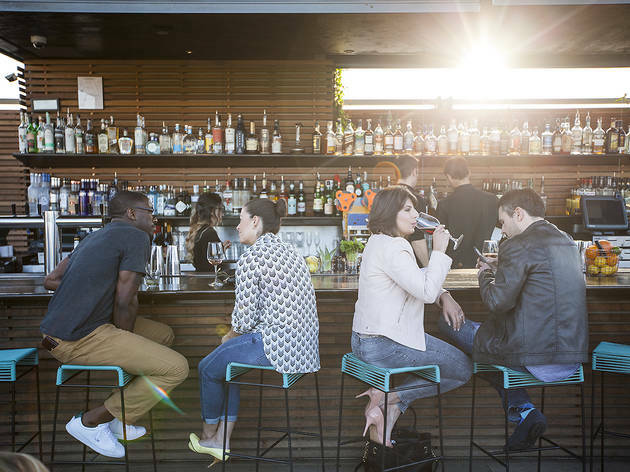 Our tip: This place gets crowded, even when it's still early. 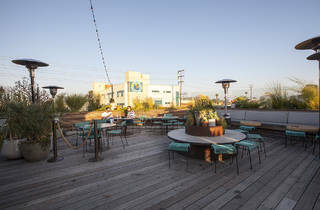 Since you can’t make a reservation for L.P. Rooftop, it's best to get there right at opening. And if you’ve had a few by the end of the night, you might want to take the elevator. Don’t be that person falling down the stairs. The drinks are great, the views are better! 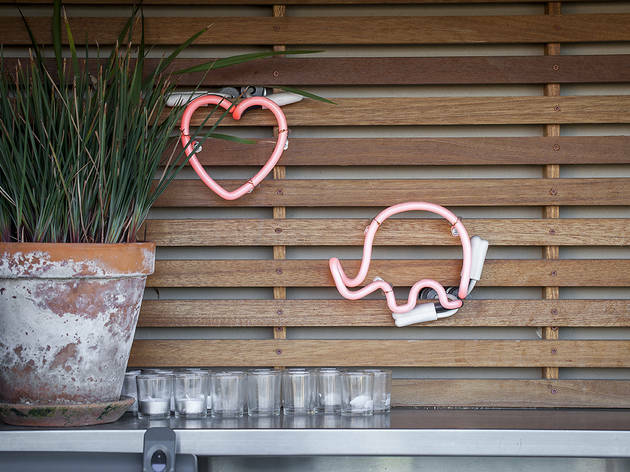 This is a really cute spot in LA and extremely well curated. Just plan on eating beforehand. I don't recommend the snacks available on the rooftop. Lovely ambiance, even if prices/drinks leave something to be desired. 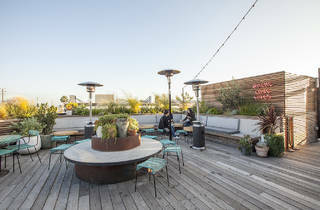 The rooftop space is large and filled with comfortable places to sit, even if the views themselves aren't very accessible (blocked by seating surrounding the space). 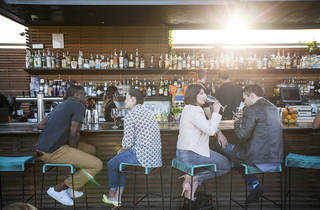 The decor is great, and the space feels very chill--if you're there on an off night. I can imagine it's more of a party party party vibe with a more typical Beverly Hills/WeHo crowd on on nights. Servers and bartenders were great, that said, not sure about what's going on behind the scenes here--we went for a themed Halloween weekend where they had drink specials. On all of the drink special menus, you could very clearly see the original prices that had since been blacked out and had been upped by a couple of dollars (from $13 or $14 to $15). The cheapest one was no longer being offered as a simple drink--you had to spend $35 to get it in a souvenir mug. Ignoring just how expensive these drinks were (even before the price increase) for fairly average cocktails--the blacked out menus seemed very low rent--definitely at odds with the vibe they seem to be trying to affect. Additionally, I had to bring back their boba cocktail--the tapioca boba was barely cooked so it was hard as a rock. That said, the bartender was incredibly helpful and made me a new drink free of charge and even poured the og drink into a new glass, minus the boba, which was unexpected. Verdict: great place if you're there minus the "LA" crowd, but you're paying for the space and the ambiance, not so much the drinks. I hope to go back and try the food downstairs, and maybe some more cocktails if I really feel like splurging. 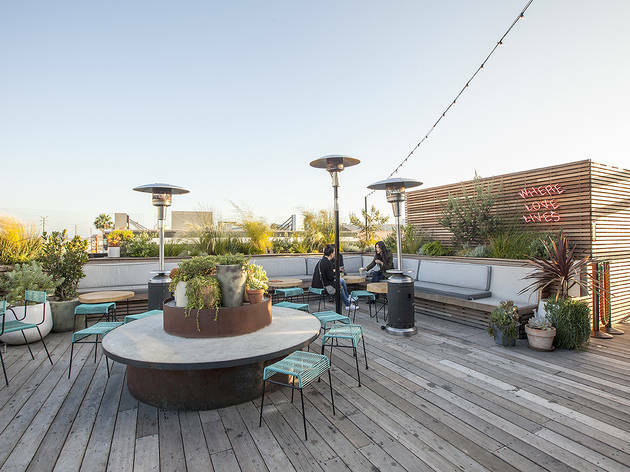 The view from here is lovely - particularly at night, though you can also make it a day-drinking stop on weekends - and the roof area is attractively furnished. When you can get ahold of a drink menu, the items on it tend to be creative and tasty, if sometimes made in what seems like kind of a rush. While not exactly the establishment's fault, the issue here is the crowd. Go when the place is empty and you'll have a great time. Go on a Saturday night and just know you may need to steel yourself for an older scene of squeaky women in "going out" dresses and men who think they can push past you at the bar because their flashy watch is bigger than your car's steering wheel. Either way, it's best as a spot to get a drink before eating at the excellent dining room downstairs rather than a destination in itself. 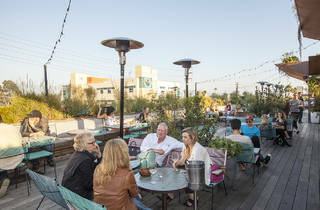 I had a great experience at the rooftop bar. 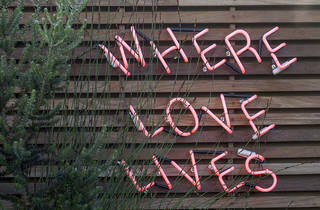 The ambiance is great and there's a nice view of LA around you. 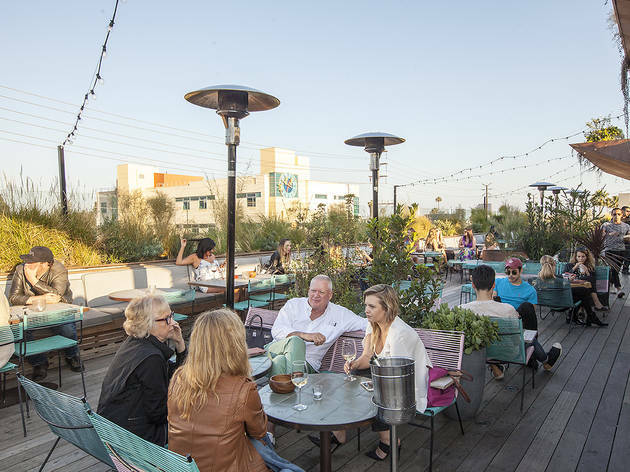 Service can be pretty slow if you go during a busy time, but it is a perfect way to get a rooftop bar experience without making the trek downtown.